We are over 1.8 million dollars and climbing! I would like to thank everyone who has contributed to make this dream possible, and in return we promise to make you the most amazing game we can. I know you all have asked for more details about the game, so let's talk about non-combat abilities. Most role-playing games can be divided into two sets of mechanics: those rules you use in combat and those you don't. For many people, an RPG is really defined by its combat. These people spend most of their time killing things and taking their loot, and leveling up is just a means to kill bigger things and get better loot. But for other people, an RPG is about the elements of the game they experience when not in combat. It's about the NPC's they talk with, the places they travel to, and the choices they make, including the choice to avoid combat altogether. Let's talk first about your goals as a player, about the things you would like to do besides fighting. Then I'll talk about our design goals and explain how we are putting the non-combat systems together. When you are not fighting, that's when non-combat abilities come into play. We plan to add abilities that will let you become better at achieving four different non-combat goals. Learning new things. This includes finding out previously unknown information, like the location of town or a hidden door, or uncovering secret knowledge, like a potion recipe or the true name of a demon. Or maybe you just want to know a good place to gather materials like ore or herbs. We will make abilities that let you find things out. Traveling around the world. You will want to improve your movement capabilities (such as sneaking around some ruins), or traveling across the world map faster or more safely, or even teleporting directly to your destination. And sometimes movement requires removing barriers like locks or traps, so you will need some way to unlock and disarm. We'll add abilities for these actions. Getting new items. If you are not going to kill a creature to take its things, then we will give you the means to make new items, buy them, or steal them. Or maybe you will choose to support NPC's by bringing them the materials or the recipes needed to make new items for you. We congratulate you on your non-violent and cooperative plans of wealth acquisition, and we'll give you the means to do it. Interacting with companions. Once we have added many interesting and useful NPC companions, we will have to give you ways to recruit them, improve their usefulness, and keep them from dying (or even worse, disliking you!). We will make non-combat abilities that interact with your companions, so you can keep them alive and filled with a grudging respect for you. Now each of these goals represents a whole slew of related non-combat abilities. For example, for player traveling, we could have all kinds of abilities, including stealth and teleport abilities, as well as abilities to make world map travel faster, less likely to have encounters, and able to make use of alternate transportation routes such as over mountains using passes or over water using ships. In putting together our non-combat system, we have made a list of goals for the design of these skills and the rules they need to follow. Non-combat skills are gained separately from combat skills. You shouldn't have to choose between Magic Missile and Herbalism. They should be separate types of abilities, and you should spend different points to get each one. Non-combat skills do not use the same resources as combat skills. You don't spend the same stuff for a non-combat skill as you do for combat skills. Some don't use anything at all to use, so you will never find yourself unable to blast an opponent if you get caught sneaking. All non-combat skills are useful. If we add lockpicking to the game, we will make sure that there are locks to pick and worthwhile rewards for getting past them. All non-combat skills can be used frequently. If you take disarm traps as a skill, you should expect more than two traps in the entire game world. Frequency of application has a large impact on how useful something is. Combat can be avoided with non-combat skills. There will often be ways to avoid fighting. Yes, we will have the standard methods of talking your way out of a fight or sneaking around an encounter, but there will be other ways too. Perhaps you can re-sanctify a desecrated cemetery to prevent any further undead from rising, or maybe figuring out a way across a ruined bridge will always avoid the bandits on this side of the river. Avoiding combat does not lead to less experience gain. You shouldn't go up levels any slower by using your non-combat skills rather than your combat skills. We plan to reward you for your accomplishments, not for your body count. We are still in the early design stages, but our plan is for non-combat abilities to make the game as fun and enjoyable outside of combat as it is in the heat of battle. 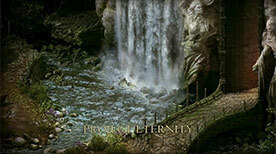 Thanks for keeping up to date with Project Eternity and stop by the Kickstarter site or the Obsidian Forums for all the latest information. Next update will be on Monday!